Most of us have figured out that there is no such thing as a Norman Rockwell Thanksgiving or Christmas. The picture-perfect, happy family sitting down together at a beautifully set table with a feast cooked to perfection just does not exist. This is never truer, than the first years after a loved one has died. For many grieving people, it is hard to imagine celebrating a single day, let alone a whole season. 1. Decide how you want to mark the season. Families tend to have traditions for celebrating Thanksgiving and Christmas. With someone missing, these traditions may feel impossible to face or may have even lost the meaning they once had. It can help to make a conscious choice of how you want to celebrate this year and then communicate that decision to the family and friends it will impact. Rather than gathering for a whole day of people and feasting, you may want to come just for dessert. If you usually go all out for decorations, try keeping it simple with just a few selected favorites instead. The important thing is you decide what feels right. 3. Look for ways to express your feelings. 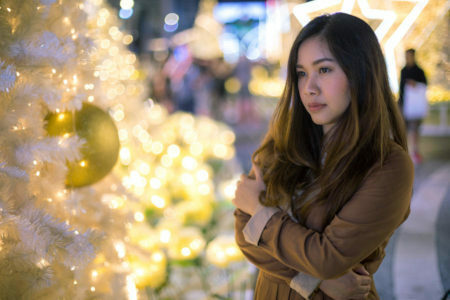 For many people, the feelings around loss (emotional pain, anger, sadness, fear, loneliness, and vulnerability) intensify at holiday time. Find ways to express the grief. Talk about your loved one and the feelings that come when you do. Look at pictures, share stories, laugh together, and cry together. You might want to commemorate your loved one in a special way. When people ask how you are, tell them of the struggle rather than glossing over your feelings with a rote, “I’m fine” response. 4. Be mindful of where you are today. Grief is a multifaceted emotion. Not only does grief express itself differently throughout the mourning process, but it is also different from person to person. Remember there is no “right” way to grieve. Be present and mindful of where you are and allow others to be where they are. 5. Let the next holiday unfold naturally. Just because you choose to experience the holidays one way this year, does not mean this way becomes the new tradition. Make decisions for 2018 and live into what you need for the holiday season of 2019.